One of the limits of writing about music, of music criticism, is that words routinely feel inadequate for capturing and rendering music’s essence. Writers who write about music also have to face the obvious fact that they’re trying to make the case on behalf of an experience that never really asked for their help, thank you very much. If we want to feel and understand what music has to say, all we need to do is listen to it, right? Once and a while, though, a writer approaches music at an angle and gets the feeling of it just right. In his book But Beautiful (Picador 2009) the critic and novelist Geoff Dyer has written a work of creative criticism that imaginatively explores the work and lives of a handful of famous jazz musicians including Duke Ellington, Ben Webster, Bud Powell, Art Pepper, Lester Young, Charles Mingus, Thelonious Monk, Ella Fitzgerald and Chet Baker. The idea of the book is to bring the reader into the inner worlds of these musicians–how they worked, how they experienced the world around them (and especially racism in America), how they thought, how jazz came to life though them, and in many cases, extracted a steep personal toll in return. “Before long I found I had moved away from anything like conventional criticism. The metaphors and similes on which I relied on to evoke what I thought was happening in the music came to seem increasingly inadequate. Moreover, since even the briefest simile introduces a hint if the fictive, it wasn’t long before these metaphors were expanding themselves into episodes and scenes. As I invented dialogue and action, so what was emerging came more and more to resemble fiction. At the same time, though, these scenes were still intended as commentary either on a piece of music or on the particular qualities of a musician. What follows, then, is as much imaginative criticism as fiction” (vii). Dyer works from the famous records recorded by these musicians, a few photographs of them (one of which is included at the book’s outset), print interviews, scholarly jazz histories, video documentaries, as well as known biographical facts about their lives (e.g. 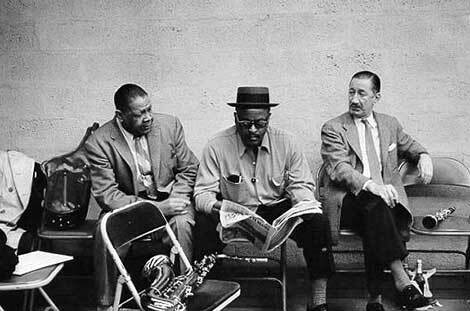 Duke spent an immense amount of time on the road where he composed music on scraps of paper and napkins; Monk was dependent on the constant help of his wife; Atkins had his teeth knocked out in an encounter with a drug dealer). From these known things, the author conjures up through sparse prose the poetry of what feels like the real lives of these musicians. A few days after reading But Beautiful I was listening to a public radio station program on which the host–from the sound of it, surely a walking jazz encyclopedia himself–was rattling off the names of several famous musicians who had worked with so and so’s band during these years. It was the normal patter of public radio jazz DJs, and it occurred to me that I had long thought about jazz in this way too: as a kind connoisseur’s thing, a recorded history reducible to stats about band line ups and tracks and famous solos that true fans follow as closely as sports fans do baseball batting averages. But knowing a famous name or a famous recording doesn’t necessarily provide the listener any sense of what it felt like to be these musicians. Enter Dyer’s creative criticism which works its poetic magic by filling in the texture of the lived experiences of these jazz innovators, letting the reader be there with them–for a time. Like a great musical performance, But Beautiful is evanescent yet leaves after images of how it organized an experience “to the level of an ordering principle with its own demands and its own logic” (41).